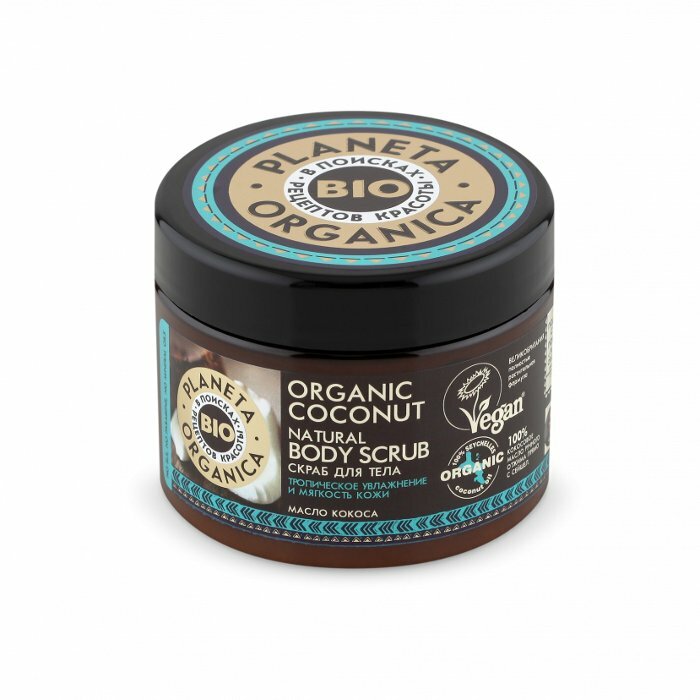 In Search of Beauty Recipes by Planeta Organica presents Organic Coconut Natural Body Scrub. Formulated with 100% organic extra virgin coconut oil imported from Seychelles, it is designed to actively hydrate your skin and make it incredibly soft. Exfoliation is an important part of your body care routine. Scrubs and peels remove dead cells, dirt, grime and excess sebum from the skin surface, make it soft and smooth, stimulate skin renewal, improve microcirculaiton, and help to prevent cellulite. Natural body scrub by Planeta Organica contains sea salt that acts as a natural exfoliating agent. Tiny salt crystals polish the skin without scratching it, make it look healthy and glowing, and provide the skin with a number of important minerals. Another important natural ingredient contained in the scrub is coconut oil. Due to its high saturated fat content, it is widely used in skin and hair care. Coconut oil is rich in essential fatty acids, vitamins (including vitamin E, an important natural antioxidant) and minerals that are essential for your skin’s health. It deeply nourishes and moisturises the skin, makes it firmer, and improves skin elasticity. The scrub also contains blue lotus extract. This natural ingredient is rich in biologically active substances and has a pronounced moisturising, refreshing, soothing and softening effect on the skin. Finally, soapnut extract is a natural surfactant that does not irritate even very sensitive skin. It produces a soft lather that makes exfoliation easier. Contains 99% of natural ingredients and 10% of organic ingredients. No parabens, no SLS, no mineral oils. Free of animal products (certified vegan). Directions. Apply a small amount of product to damp skin, massage, rinse with warm water. Ingredients. Sodium Chloride, Glycerin, Organic Cocos Nucifera (Coconut) Oil, Cetearyl Alcohol, Nelumbo Nucifera (Lotus) Flower Extract, Sapindus Trifoliatus (Soapnut) Fruit Extract, Cocamidopropyl Betaine, Maris Sal (Sea Salt), Parfum. Want to buy Organic Coconut Natural Body Scrub? Call us or submit your order via our web site! In Search of Beauty Recipes is a new collection of natural and highly effective cosmetic products manufactured by Planeta Organica, a Russian-based company. Its exclusive distributor is Pervoe Reshenie (First Solution), another well-known Russian cosmetic manufacturer. Founded in 2002, it has since become one of the leaders in the country’s cosmetic market. To create formulations for the new collection, the team of Planeta Organica embarked on a journey in search of the best ingredients and beauty recipes from different corners of the world. During their expedition, they selected the best organic oils and extracts that are suitable for all skin and hair types. In Search of Beauty Recipes by Planeta Organica offers a wide range of skin and hair care products, including shampoos, conditioners, hair masks, body scrubs, hand and body creams, and more. They ensure an immediately visible and long-lasting result, helping to keep your skin and hair healthy and beautiful at all times.